It’s time at last to get around to the first post of 2017. I’d like to say I’ll be posting more regularly this year but realistically that is unlikely to happen. When I do get round to it, there are still old games to play so lets start with a handful of Origin games I forgot about when I was originally blogging through them all. 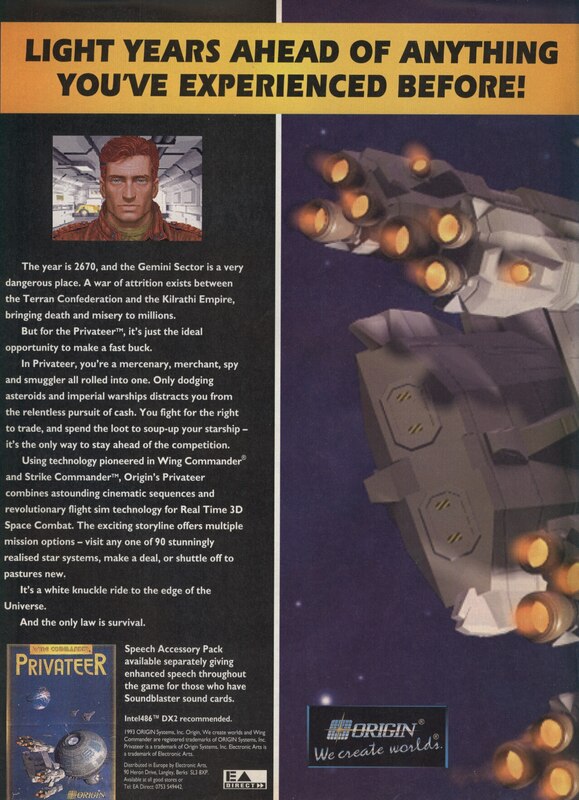 Probably the most significant Easter eggs ever to make their way into Origin products were 3 text adventure games hidden away in the files for Privateer, Privateer – Righteous Fire and Wings Of Glory. These were all created by Arthur DiBianca, a coder at Origin during the 90’s. To find these hidden games, you need to search through the files for each game and look for the one starting with tab. The filename is actually reversed and in this case should be advent.bat, so it simply needs renaming and copying into an otherwise empty directory. 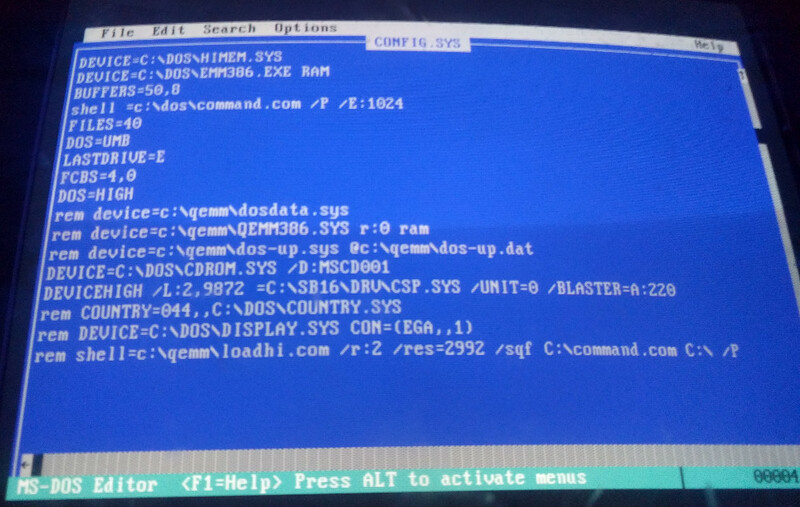 You then type advent setup to start, except I discovered at this point that with all this batch file trickery going on, DOS ran out of environment space. To fix this, you just need to edit your config.sys file and reboot. The relevant line is shell=c:\dos\command.com /P /E:1024. This maxes out the environment space in DOS and will fix the errors running these games. Running the setup generates a load of little batch files for all the commands in the game. 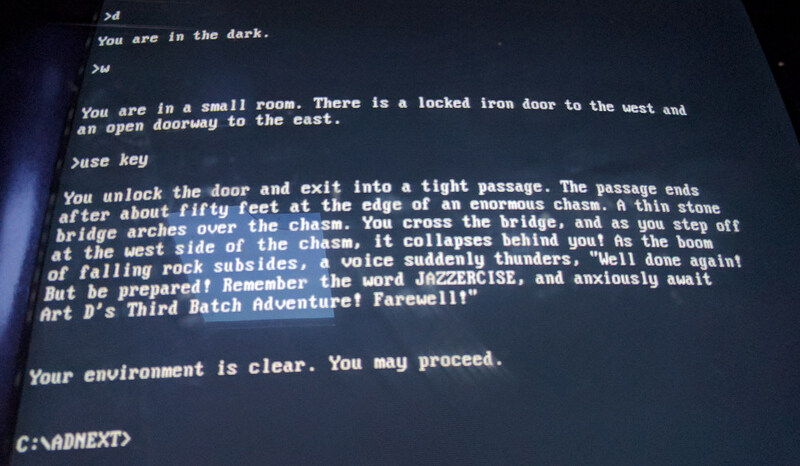 These text adventures play entirely from a tweaked command prompt so there is a look.bat and n, s, e and w.bat files, etc. Each command in the game is actually a call to run the relevant batch file. These files pass along their calls to the main advent script which does the heavy lifting. If you supply a second word, i.e. look lamp, then lamp is passed as a parameter into the batch file. Presumably all the variables for the game are stored in the DOS environment. It’s kind of ingenious really and shows how much you can do with batch scripting. I would imagine it’s not the most practical language for the job but it clearly works. 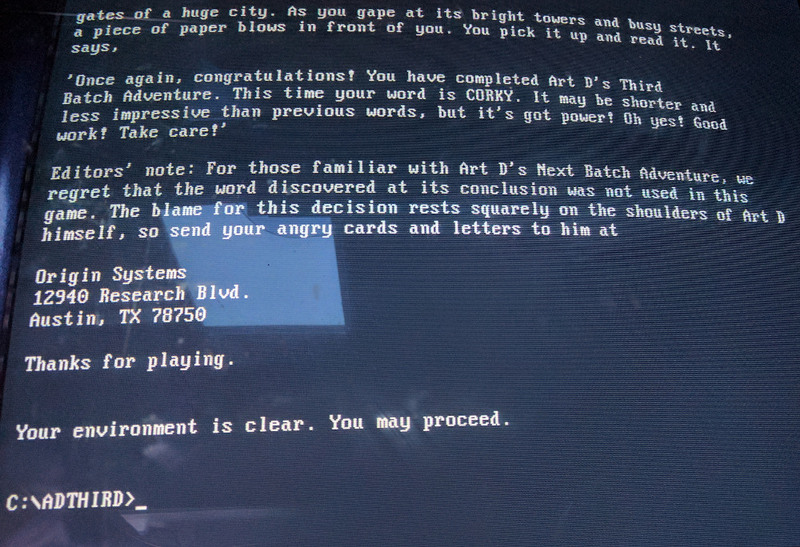 Of course with the whole game being played from a DOS prompt, you don’t want to be typing any unwarranted DOS commands while playing this (other than dir which gives a verb list). 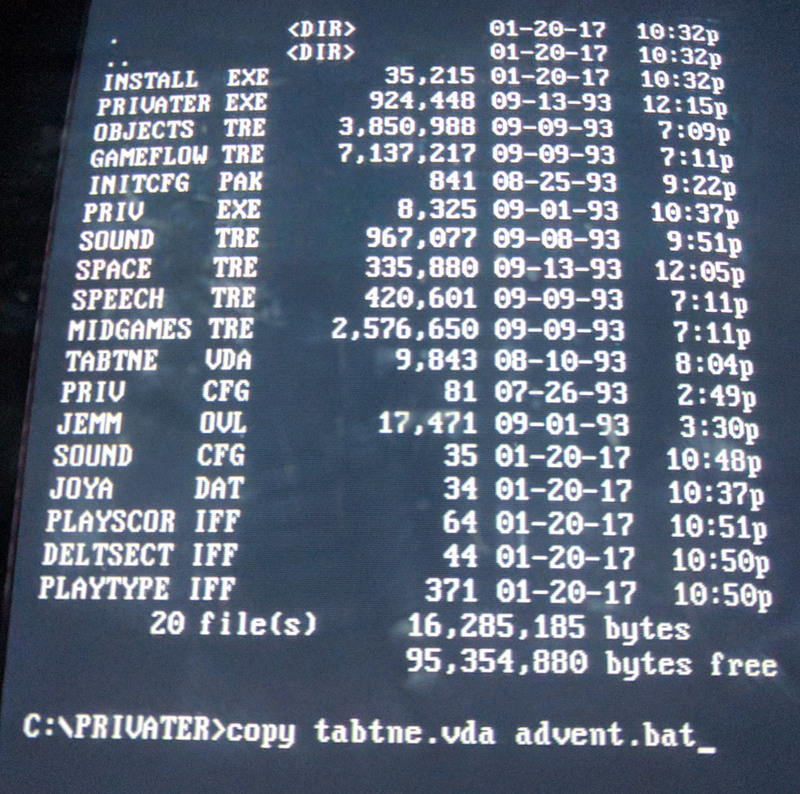 Having spent a while getting it running, the first game took all of a couple of minutes to beat. I won’t give away too much but it essentially revolves around learning a few magic words to teleport around the world. There isn’t a plot to describe in any of these games, it’s along the lines of Zork with somewhat random locations and puzzles to conquer. At the end of the game, I’m rewarded with a magic word to carry into the next game which was included with Righteous Fire. The second and third game are substantially larger with maybe 10-20 locations each and a good deal more puzzles. That isn’t to say they will last more than 5 minutes a piece but they did make me think. 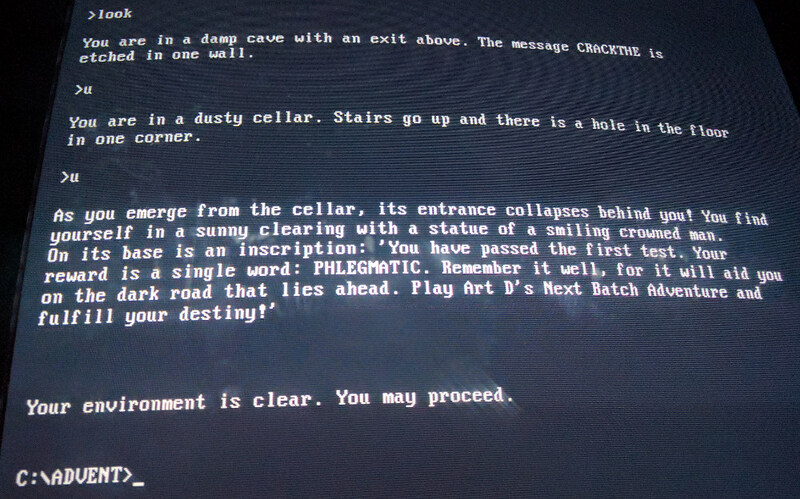 I’m glad to say there was no resorting to that staple of text adventures, large mazes with identical locations. Did anyone ever actually enjoy those things? I can’t say I’m any the wiser having got to the end of these as to what exactly is going on. There is some mention of a crowned man apparently obsessed with breadsticks. This has to be Lord British but don’t ask me where the breadstick interest comes from. 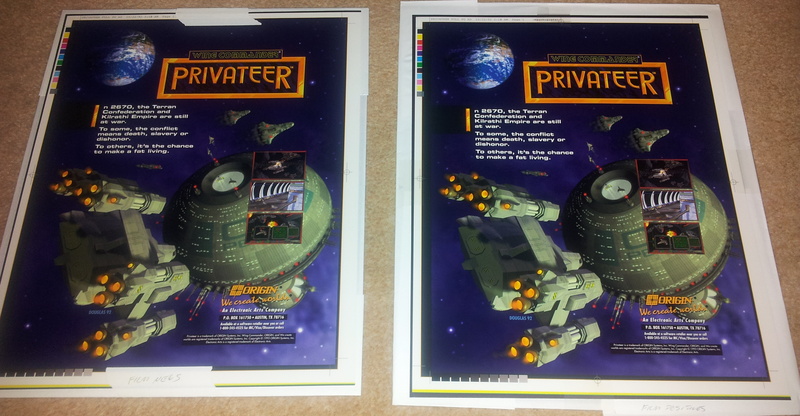 It’s a pair of proofs for a full-page Privateer advert + the negatives/positives they were created from. The one on the right was created with the positives and the image is slightly darker and clearer but that’s unlikely to show in one of my photos. Whatever the quality of my camera, I have to say these do look good in the flesh. 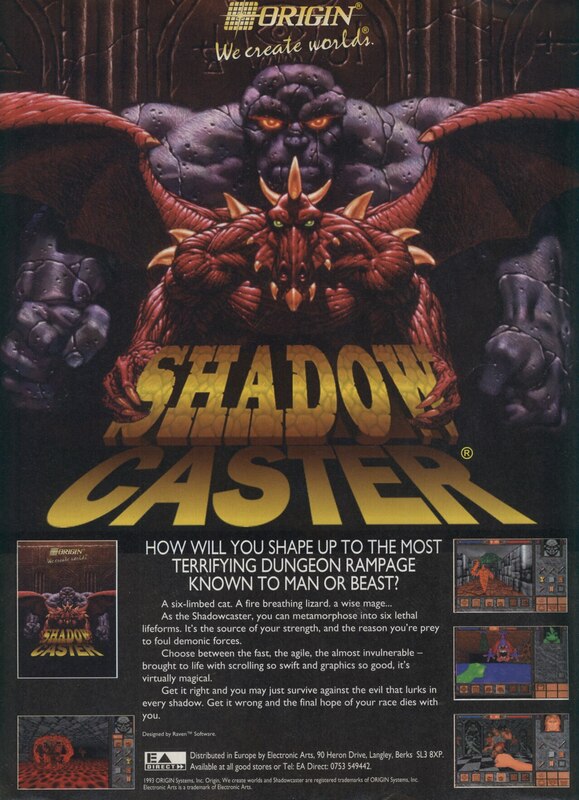 Later adverts had more screenshots and text with a smaller boxart image which may have done a better job of selling the game but was nowhere near as pretty. 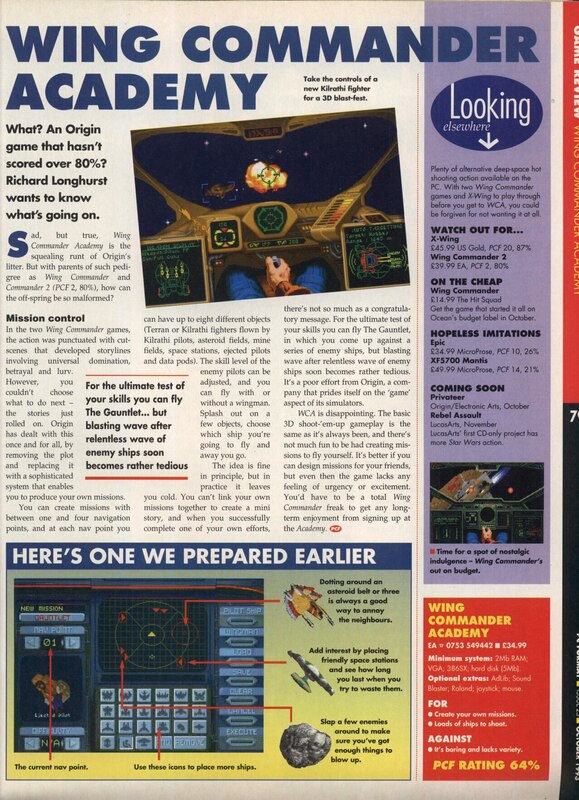 The early date of these (October 1992) puts them almost a year before the actual September 1993 release date with the screenshots used being the mockups I just about remember seeing in press releases of the time. The logo is noticeably different to the one that was used in the final product and for some reason the year (2670) is one year later than the 2669 used in the intro cinematic of the game. The Origin working culture is once again in evidence with the fact that the timestamp on these is slightly after 3:00 AM. I’ll be attempting to at least match that time at the CIC bash tonight but whether I’ll manage it is highly debatable. After 24 hours of non-stop webcasting, the Star Citizen fundraising ended at a staggering $6.2 million. It’s so much money that they ran out of stretch goals, although it may be an idea to come up with some more as the money is still trickling in on the RSI site and is nearly up to $6.5 million. This may well not be the final version of the ad as I’m sure I’ve got proofs for some other variants with different screenshots and/or a larger background image without the border. I ought to check but it will wait for another post when those other proofs make their way to the top of the pile. 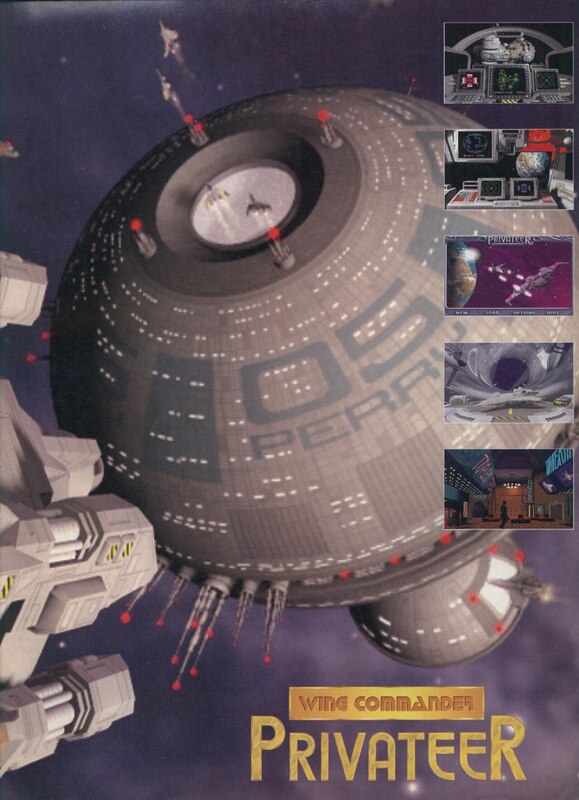 It includes a brief history of the company, interviews with Richard Garriott and Chris Roberts, previews of coming games (with Warren Spector interviews) and a look back at the Ultima and Wing Commander series. There is so much misinformation in the Ultima history that it beggars belief but there is plenty of good content in here otherwise. According to the Ultima 8 article, at this time Garriott saw the Avatar as being separated from the human plane and more of a supernatural being in Ultima 9 and already had an Ultima 10 plot ready to go. After all the Underworld posts yesterday, I’ll rein myself back to an entry a day again for the moment. If you still want more Underworld, I’d strongly recommend having a look at the anniversary page over at the new home of Ultima Aiera (www.ultimacodex.com). There is an interview with Dan Schmidt (including a handful of questions from yours truly), design notes, concept art by Warren Spector and plenty more besides.